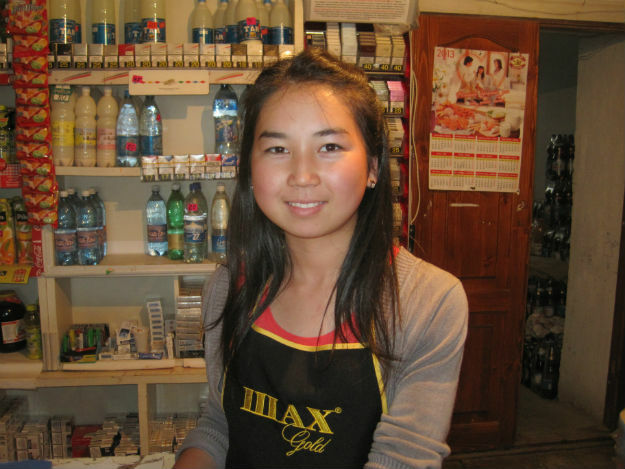 A girl working in the family store in Bokonbaevo. I’m a fan of big, round, Kyrgyz faces. I’ve had it with marshrutkas, which are old, 18-seat vans that act as public transport all over the country. They’re too small, too slow, stop too often and if I have to stand in one, I must stoop and I can’t see out the window. I’m hitchhiking as much as possible now, especially after today’s events. It’s good to know hitchhiking is a viable option. I like the mobility and options it gives me and it feels like traveling at its best. That doesn’t mean everything was great, but worthwhile. Communication with drivers is tough, but I make do. Speaking a little Kyrgyz jazzes people up, I’ve discovered, but Russian is the lingua franca here and it’s still an official language. I started from Karakol and headed west along the less-developed, more dramatic, southern side of Lake Issyk Kul. I quickly got a ride from a guy wearing a Clovis East High School Wrestling t-shirt, which is an hour from where my parents live in California. When we arrived I was going to take a photo of him, but first he tried to get me to pay 250 som ($5) instead of the 25 som we agreed. Jackass. I had a tense couple of moments as I thought he might try to speed off in those two seconds it takes for me to fetch my bag out of the back of his car, which is the hitchhiker’s drama every time. After a few more rides I was plopped down next to these two girls, a Finn and an Israeli. They were waiting for a marshrutka to Bishkek. I offered to have them hitchhike with me, saying we could go to the apricot festival and then could go tomorrow. The Finn was desperate to go, getting the shakes from not seeing her boyfriend in six months (“Six months plus a day, you can wait!” I said, but she wasn’t having it.) The Israeli girl wavered, but a marshrutka came and off they went. I got a faster ride to Bokonbaevo, so when they arrived I was already at the station waiting for them. That’s a powerful advertisement for hitchhiking. That’s a powerful advertisement for me, too: a confident dude traveling in an unconventional way, knowing about obscure events, having fun. I am irresistible. Wait, let me put in my teeth. 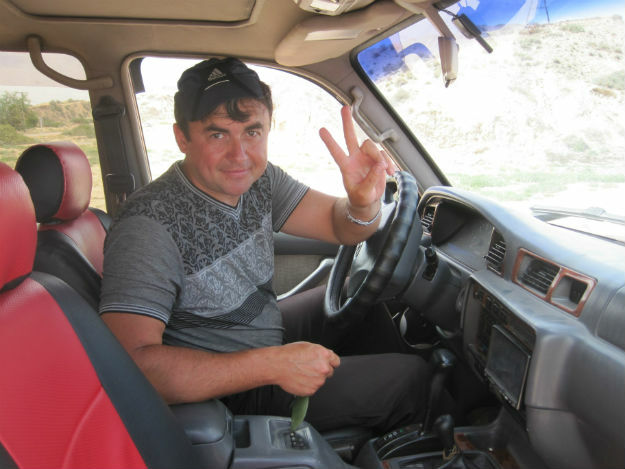 This super-nice Russian guy gave me a ride to the apricot festival. 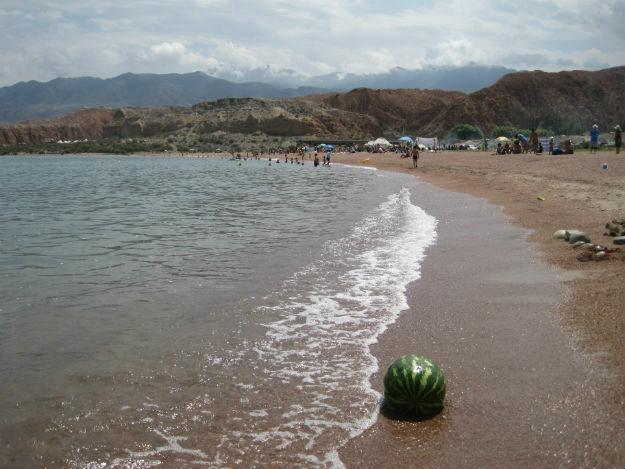 A watermelon cooling in the water on a sweltering day at Ton beach. The apricot festival didn’t impress me. 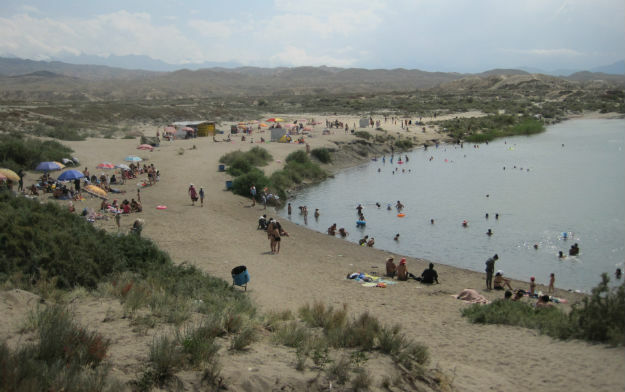 It had a great location right on the beach in Ton, near the town of Bokonbaevo, but without any shade in the brutal heat. Plus, foreigners had to pay 500 som ($10) to attend, which is a lot of plov. Locals supposedly pay 200 som, but no one really needed to pay anything as it was open. I walked along the beach a while, got an apricot danish, and left. As I was hitchhiking back, a French traveler was dropped off next to me by a truck. He was traveling with a badminton racket strapped to the top of his backpack and three big maps wrapped in a meter-long tube. He had just spent three years in China, he explained, and they wouldn’t let him mail the maps home. They didn’t look to be anything special, but he decided they were worth carrying home on the Silk Road. He had recently come overland from Kashgar, which is my destination. I pumped him for information incessantly while car after car stopped for us, all trying to get us to pay too much to go back to town, which amused him. This Kyrgyz woman picked up the French guy and me. I was hoping she would open her mouth as she had an amazing display of gold teeth. I had her take the French guy into town while I got out at the bypass because I decided to go 40km west to Tuz Kul, or Salt Lake. The Salt Lake sign. Can you see all the wild lavender or whatever that is? I’m really letting you down by not having a better camera or better photographic skills. It was crazy to hitch another 11km on dirt roads to get to the lake, but it was easy going both ways. Supposedly the Salt Lake mud has therapeutic properties so it is smeared all over. Picking up hitchhikers—fun for the whole family! Where are all the classic Soviet-era cars? Ladas, yes, but I’ve been disappointed not to see many Moskviches, or my favorite, the Volga, a tank of a sedan. Instead, there are mostly old BMWs and Mercedes, Japanese right-hand-drive cars (how do they get delivered here? ), and Kyrgyzstan is paradise for 1990’s German truckspotters. Been gone six and a half months. I’m tired. Another great blog! I’m interested in that area of the world. Sounds like its got a little spice with the sugar though. Thanks! It is paradise for hiking and pretty cool, too. If you are already in Europe you can’t pass it up since flights are cheap. I like your style! 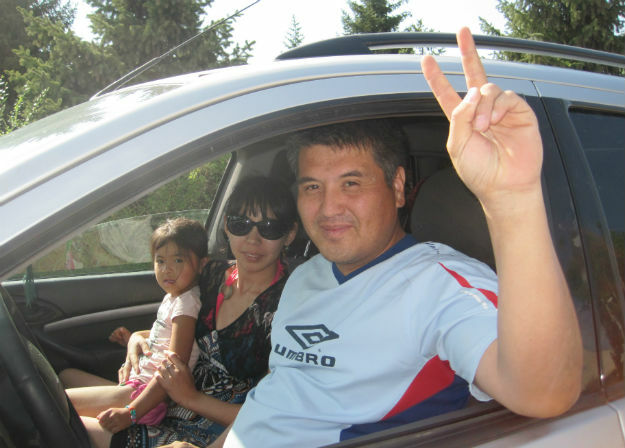 Kyrgyzzstan is big in car trade. Drivers take a train to Lithuania or Vladivostok where all second-hand cars come together from Europe and Japan respectively, then drive across Russia and Kazakhstan in 1 go – takes them no more than 4 days. Driving here from Vladivostok…I can’t even wrap my head around that. Must be amazing. I like to peek at the odometer of some of these cars to see how many km are on them. Kento, if you happen through Vladivostok have a look at the bargains to be had on Japanese cars there? Perhaps there’s a harebrained scheme in there somewhere! Steven, no lie! I’m amazed how often I spot familiar faces on the streets here. Must not be quite so often in Almaty, though? Maki and I are thinking about coming over next month for the TEDx thing, by the way. Maybe see you around? The process for getting Japanese cars is very simple: Russian sailors and fishermen go to Japan, buy a used car, use a tax loophole to bring it back, and sell it on the other side. They do that about twice a year, they all do it, and there’s a lot of them. Yes, but I meant the process of driving a car from Vladivostok to Kyrgyzstan must be an incredible ordeal. Also, sometimes Russia changes the rules about what kind of cars you can import, from what I’ve heard. Love it man, I just stumbled upon your site, but glad to see others still traveling authentically. I have only hitchhiked twice to date, but both have been good experiences. Thanks for sharing, I’ll be following now! Thanks! Glad to have you aboard! If you pick your spots right, hitchhiking can be a great way to go. In Isakul Area they tried to rob and kill us for not paying them for a ride! We thought hithchiking is free! !